CERBIOR Extendable Pot Mover(plant caddy , plant stand ) will be your best choice! Our plant caddy features plastic castor design with powder coated finish. It allows you to easily and safely reposition pot plants in your backyard or balcony without heavy lifting. The caddy made from Carbon steel with anti-rusting powder coating. Medium duty 80lbs capacity and extendable legs accommodate large and small pots and locking wheel secures it in place. Note：When place the plant onto the caddy,please ADJUST the caddy's extendable legs according to the size of your plant ,to ensure the caddy's maximum hold capacity. When placing your pot , ensure that the load is evenly spread over the wheels. When using the maximum length of the adjustable legs, ensure that all legs are extended evenly so the weight of the pot is above all wheels. If your item is damaged in transit or defective , please contact us for a refund or have a replacement sent to you . REDUCES HEAVY LIFTING WITH EASY TURN AND LOCKING WHEELS- With lockable caster wheels 360-degree solid construction.the easy to turn wheels provide easy glide when move a heavy plant and makes moving around very convenient. 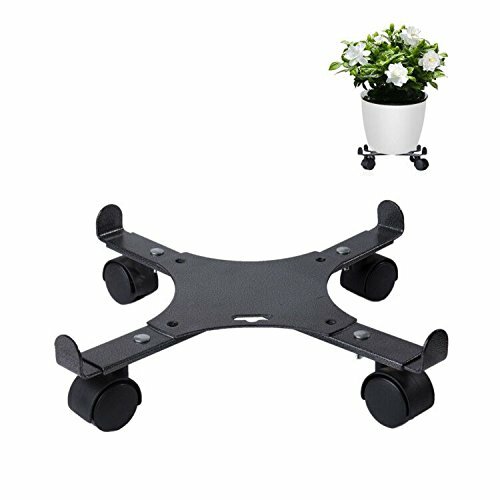 It allows you to easily and safely re-position pot plants in your backyard or balcony without any heavy lifting. EXTENDABLE AND FLEXIBILITY -This plant caddy come with four extendable legs that can be extended from 15 inches to 20 inches, which accommodate large and small pots. The plant Caddy is also lightweight for 2.85 lbs, makes it portable for use. DURABILITY AND LONG LIFE- This is a heavy duty plant caddy, the capacity of this 4 wheels expandable pot mover is 80 lbs. constructed with high quality materials, made from Carbon steel with anti-rusting powder coating.it will last for years to come. MODERN AND STYLISH- our powder coated finish four wheels extendable plant caddy have a modern design, the metal finish which will not only look great on your patio or deck, but also your home entry way, even your office too. SATISFACTION GUARANTEE- our Extendable Plant Caddy is SATISFACTION GUARANTEED, Is backed by a manufacturer 30 day money back guarantee, you can buy with confidence from Cerbior.